The yearly World Intellectual Property Organization General Assemblies opened today. WIPO Director General Francis Gurry in his opening report to the member states underlined the rising demand for intellectual property protection, which continues to offer a healthy financial situation for the fee-financed organisation, but called on delegates to look into the future and start discussing questions linked to the use of new technologies, such as artificial intelligence. The 58th WIPO General Assemblies are taking place from 24 September to 2 October. Delegates taking the floor on the first morning reiterated positions on potential treaties on the harmonisation of design law applications, and the protection of broadcasting organisations, urging the Assembly to find solutions to entrenched divisions so that high-level negotiating meetings can be convened soon. Some countries called for more geographical representation in WIPO high-level executive bodies: the Coordination Committee, and the Program and Budget Committee. 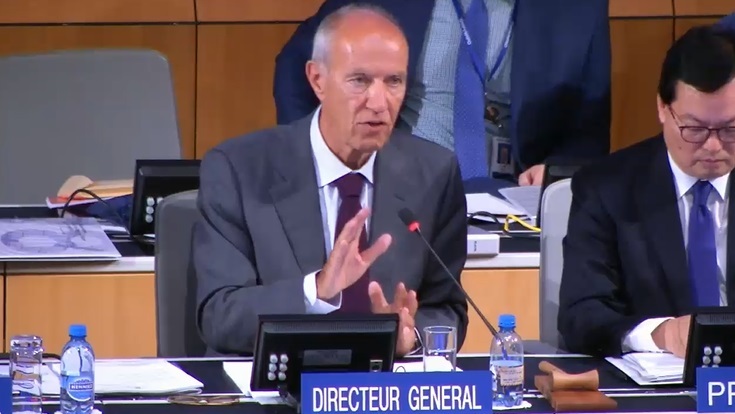 In his report [pdf] to the member states, Director General Gurry underlined the good financial health of the organisation as the demand for intellectual property protection, and WIPO services, continues to grow, he said. This increased demand is driven by “rapid, profound and pervasive technological change, which is shaping the future of the economy, and placing increasing value on knowledge,” he added. IP applications are sharply rising, he said, citing 3.1 million patent applications, 7 million trademark applications, and 963,000 industrial design applications in 2016, the latest statistics. He also reflected on the geopolitical change, with Asia now being the dominant source of all IP applications filed worldwide. Accessions stand at 41 member states after five years, he said, adding that the European Union is expected to accede the treaty imminently, bringing the membership to almost 70. An EU delegate confirmed that information in his opening statement and said the treaty will be acceded by the EU during the WIPO General Assembly. As more member states are preparing to accede to the Marrakesh Treaty, “we may now look with some confidence to a time when the treaty will be universal, which will be a great achievement for the organisation,” Gurry said. The demand for capacity building is also growing, according to Gurry, and the WIPO Academy is “experiencing record levels of participation,” both online and in person. He mentioned the importance of public-private partnerships, and cited WIPO Re:Search and the Accessible Books Consortium, both hosted by WIPO and characterised as active and successful by Gurry. Later this week, he said, a new PPP will be announced. PAT-Informed is a partnership through which 20 large pharmaceutical companies will provide data linking patents and medicines around the world to facilitate procurement of medicines. Gurry presented two artificial intelligence applications developed by WIPO. The first is neural machine translation. Beyond its use within WIPO, in particular in global databases and in the translation work, it has been licensed, free of charge to 14 international organisations to help with their translation work. “If you can imagine on 7 million trademark applications, many of them containing figurative or graphic elements, for a human being to search the similarities of this with everything that is preceding, is quite difficult,” he said. Some are of the opinion that the current IP system might have some gaps when it comes to data and artificial intelligence, he said, calling for member states to start a conversation on the topic. “I am not suggesting that the world is in any way near formulating any new rules,” he explained, but about asking the right questions. “We could all benefit from sharing knowledge, views and perspectives on these issues so as to advance our common understanding,” he said. Gurry also announced the creation of a dedicated division within the WIPO Legal Counsel’s Office on the judicial administration of IP. A master class was subsequently organised in Beijing in cooperation with the Supreme People’s Court of China in August, he said. In November, WIPO will hold the inaugural WIPO IP Judges Forum (7-9 November), he said. Following Gurry’s report, regional coordinators and individual countries were invited to give their opening statements, most of which contained remarks on WIPO’s normative agenda. In particular, country delegates mentioned an administrative treaty on industrial designs, for which the convening of a high-level negotiating meeting has been on hold for five years due to disagreement on two issues: the inclusion of an article on technical assistance in the body of the treaty, and the possibility for countries to ask for disclosure of origin. Both requests are come from some developing countries. Also mentioned this morning was a potential treaty protecting broadcasting organisations from signal theft. Some countries are of the view that this treaty should not concern internet-based transmission, while some others argue that new technologies, including internet services, such as deferred transmission or catch-up programmes should be covered by the protection. Indonesia for the Asia and Pacific Group asked that the WIPO Coordination Committee be more balanced in its composition. The group submitted an updated proposal [pdf] for the five unfilled Coordination Committee seats. The five seats, the proposal says, should be allocated to better reflect the WIPO membership and the relative size of WIPO regional groups as well as the accessions to the Paris and Berne unions since 2011 from the respective WIPO regional groups. Every regional group should be represented in the Coordination Committee, the group says. Indonesia, for the group, said the WIPO Program and Budget Committee should be open for participation by all WIPO member states. The PBC is currently composed of 83 members. "WIPO In Good Health, IP Demand Rising, New Technologies Coming To Fore, Says Director" by Intellectual Property Watch is licensed under a Creative Commons Attribution-NonCommercial-ShareAlike 4.0 International License.